HARA will be returning to flight on October 13th, 2018! 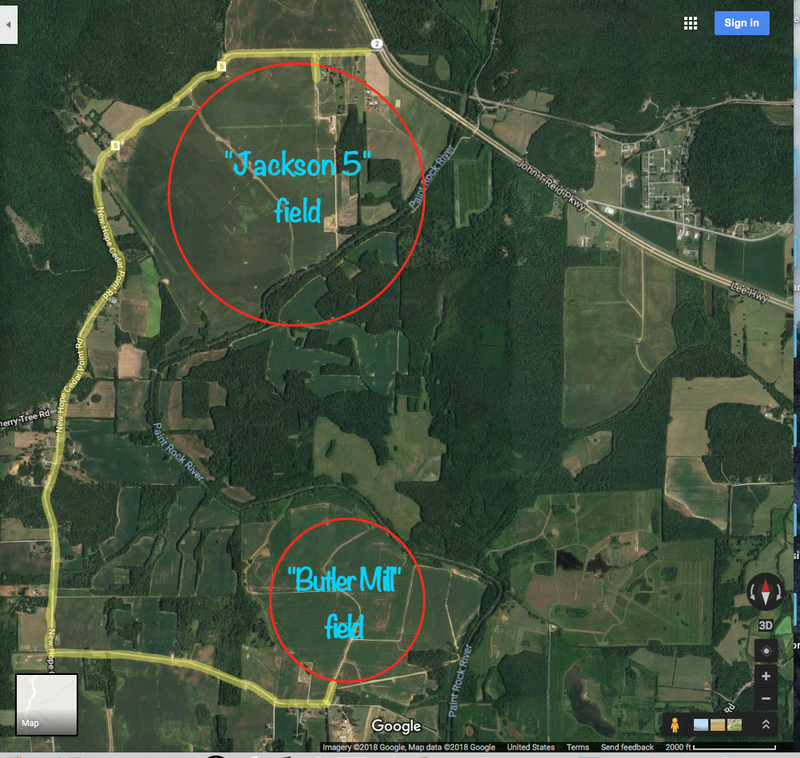 The new fields are located about 35 minutes east of Huntsville, around the Woodville, Alabama area. Currently, the schedule will fall close to the second weekend of the month, but may need to flex a little depending on weather. We have a choice of 3 fields, and will announce which one we will be using on this web site and on the HARA Facebook page before each monthly launch. We’ve scheduled the flights this way to avoid conflicts with the flight schedules of the surrounding clubs (BRB, PMW, SeARS), and our vendor, Chris’ Rocket Supplies. Also, please note that there will be a launch fee of $5 for non-HARA participants (spectating is free). The below maps will help you get to the new fields – we recommend you approach via Hwy 72 to avoid some very narrow roads that the map services may send you down (extremely difficult for large vehicles). After turning onto County Road 5, you will take the first left to get to the entrance to the Jackson 5 field. If we are launching at Butler Mill, please continue south on County Road 5 until it intersects with Butler Mill Road. Turn left on Butler Mill and continue until you pass the cemetery. The entrance to the Butler Mill field is the next left. Please remember our warning about the narrow roads! Flights up to 10,800 feet will be allowed at any of the 3 locations, as the FAA has set a maximum ceiling of 12,000 feet for the area (we need a 10% margin to insure the ceiling is not exceeded). We will be scrupulously enforcing this ceiling, and any rockets the RSO/launch director deems to have a significant chance of breaking 12,000 feet will not fly. No vehicles – of any sort, including gators and 4 wheelers – will be allowed on the fields. Please park on the sides of the road, taking care to allow for traffic to pass. As is the norm, the RSO/launch director may disallow a flight or any activity deemed to pose a hazard to those at the launch or that has the potential to damage the field or other property. Important! If you see or experience inappropriate behavior, please notify one of the launch officials immediately! Also notify an official if you loose something (motor casing, nose cone, altimeter, etc., etc.) – we would like to find it as soon as possible. Debris left on the field could damage equipment, which in turn could cost us our launch site.